Remember how Amazon.com got rid of their whole Atheism section for some reason? Well, they’ve informed me everything is fixed now — and it’s true! No explanation was given for why it disappeared in the first place… but your complaints must have annoyed them enough to fix it 🙂 Nicely done! So have at it and get your atheism-related books. 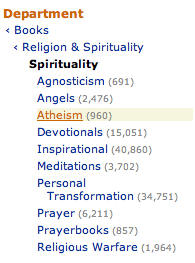 Next time, we’ll complain about getting the category out of the damned “Spirituality” section… as if that makes any sense. Special thanks to my Amazon Inside Agent “Fiona” for helping with the situation! June 16, 2011 Do We Really Need This Many Atheist Conferences? I’m delighted to see that there are still more book about me than there are prayerbooks. There are twice as many books about religious warfare than atheism. Are there special tactics that theists use in battle? Possibly not, but there’ve been a heck of a lot of religious wars. That category being overflowingly full actually makes sense. That’s what the Inspirational category is for, hoverfrog. I was actually glad that they got rid of it. That way, more people who wouldn’t normally be looking for atheism books would come across them while browsing. This video is short (10 minutes) and the speaker explains the concept of “filter bubbles” – being trapped in a filtered-results search where a computer algorithm is censoring what you see in order to bring you more “relevant” results, at the (very high!) cost of “accidentally” exposing you to something you might not normally be looking for, but just may be interested in anyway. That is specifically why, if you ask me, people still like to shop in stores like Barnes & Noble, when Amazon has not only better prices but a bigger selection. There is something to be said for browsing. No we just need more atheist books in there! why exactly did we complain to get lumped back into the religion section again? this seems to lend credence to arguments i’ve heard from believers that atheism is just another religion which usually followed by something about science being one as well.this makes me think of your post from the other day about why we aren’t a bigger political force; something i’ve often wondered about myself. i theorize that many people think that if we organize we’d just be seen as another religion trying to force our “belief” in reality and fact based truths. A simple question of categorical thinking: Is atheism a subset of “Spirituality?” My own tendency would be to include atheism in a section on philosophy (with the Cynics, Nihilists, Epicureans, and Existentialists) or cosmology. But Spirituality? Right under books about angels? Really and rationally? There will always be people that will be suspicious of atheists, no matter what they do. There have been Christians thinking that atheists are taking away their constitutional right to religion, but that’s not true, what they wanted was a right to indoctrinate their faith to children, etc. using government money. It’s not government’s place to teach a particular belief system, theist or otherwise. Having a category in Amazon is only threatening in an imaginary way. As long as atheism isn’t a real threat in itself, trying to politically or legally deny people the right to believe what they want, then I don’t see a problem. As to where to put the category, I think it’s a tough one, the disbelief in a higher reality isn’t a cohesive philosophy. Maybe humanism is, but humanism isn’t necessarily atheist. Wow, that was quick. Cool that they are so responsive, though that makes me think probably some Christian complained and that was why it disappeared in the first place. I don’t really mind it being in the spirituality section – most books in the atheist section will be adressing a lot of spiritual topics anyway, plus it makes it more noticeable for religious people. Under Spirituality? Really??? Isn’t this like putting Creationism under Biology? I guess we can call this our “wedge” strategy, eh? Whether any of us like it – most if not all people are innately spiritual to some degree – even if that spirituality has nothing to do with gods, angels, fairies or unicorns. Even Atheists can be spiritual. We can feel a connection to our fellow man and universe. It doesn’t mean we believe that there is a supernatural presence “connecting” us. I just went on amazon.ca and there is no athiest or agnostic category. I also went on amazon.com and didn’t find them. this is the list of what I found there. @Dianne: You’re one level too high. For both .com and .ca, click on Spirituality.